One day while driving, I rode by a church sign that said, “ I don’t know what the future holds, but I know who holds the future.” As I read it, I felt God tap me on the shoulder, telling me this was the lesson he had been teaching me over the last few years. It has been one of the hardest lessons I have ever had to learn. So if you are struggling and feel weary, take note of this. 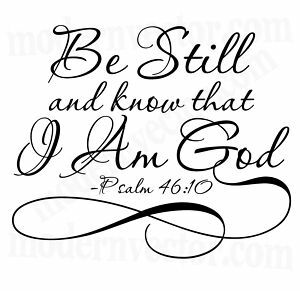 “Be still and know that He is God.” He wants you to trust in him. Know that he loves you and will never forsake you. He is the King of the universe and can do anything. Trust in Him and peace will follow. Most of all Jesus, I am so thankful you hold my future and I don’t. Even in this, You can make all things work together for my good. As I look at this past year, I have so much to be thankful for: healthy children and family members, the love of great friends, and the provisions of the Lord in ministry and work. This last year has had its challenges with many ups and downs, joys and fears, but through it all, God has been right there. Every step of the way He has held me up, as I cried, complained, laughed, comforted, prayed, worshiped, hugged, screamed, panicked, or felt his calming spirit. I would love to say I did it all right but then we all know that is not possible. I have had to ask for forgiveness along the way and have graciously been given some by others. My story is not any different from yours I am sure. 2013. A new year, a sense of a new beginning, a new outlook, a fresh start so to speak, and one that I am going to use to bring more balance into my life. I want to move forward with the Holy Spirit’s guidance. I know it sounds huge, and it is especially difficult for me. I have done a lot in my life out of obligation, fear, guilt, selfishness and yes God’s calling also. I just want to move forward with less of the old self and more of Him. Dear Lord, I pray in this next year that you transform my heart and the hearts of everyone who is praying this with me today, to beat as your heart beats to see with your eyes the world as you do. I pray for grace, compassion, wisdom, and discernment to move in the Holy Spirit and not from my own wounds or judgments. I pray for those who feel forgotten, that they experience your love and know your voice. I pray for guidance as we move forward as a nation that we put you FIRST above all else. It is in GOD WE TRUST!!! I pray peace for those who have lost loved ones this past year in the tragedies that have been beyond our comprehension. May your love and hope fill the hearts of those that are without and bring them back under the cover of your wings for rest. May we continue to love, worship and serve you with all of our hearts. In Jesus name we pray Amen.